The Salt People — The Concert Co. The Bay Area has been rich with eclectic art since far back in the 1960’s when it was the center of the national spotlight. Music is deep in the soul of this fog-filled area and the best acts move the still free-spirited crowd. I had an invitation to see one of these groups, The Salt People, at Neck of the Woods in the Inner Richmond district of San Francisco. They were celebrating their latest album release, Hearts of Clay. 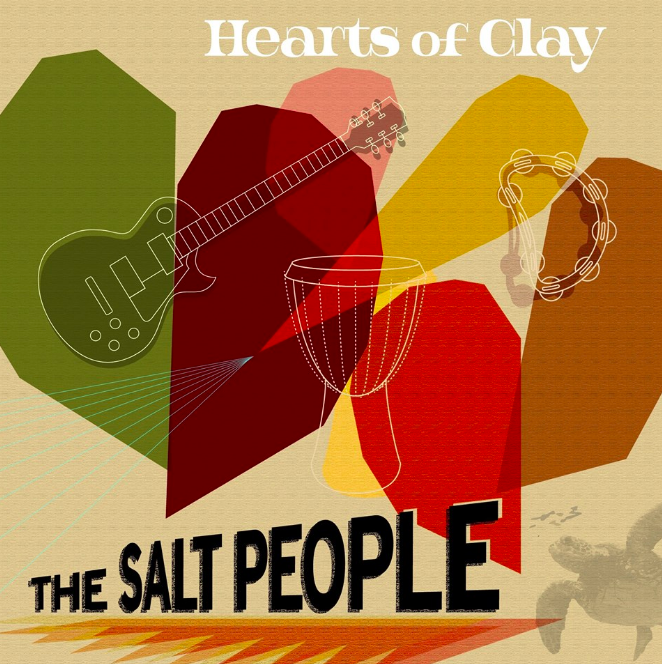 The Salt People are San Francisco based and a powerful mixture of the stuff that makes the Bay Area crunchy - soul roots, folk and funk rolled into a rock & blues band. Each member brings their own special spice to the group. Neither overpowers the other, and they blend together to make a powerful and harmonized work of art. Val Serrant (percussion) channels his homelands, Trinidad and Tobago, through his spiritual rhythm powers. Kaylah Marin (lead vocal) offers her soulful rich tones. Kevin North (lead guitar) provides sophistication with his London-based/trained technique and Henry Mobley (bass guitar) keeps the knot of the band together. Jason Young Son (drum) was an engaging addition for the night. I had a good idea of what to expect that night. Before arriving at Neck of the Woods, I had a chance to admire the Hearts of Clay album cover art - earth-tone splotches behind a floating guitar, drum, tambourine, and turtle. (I learned that this sea turtle was Kaylah's symbol). What I didn’t expect was the performance to start to close to midnight. It’s not always so easy for me to stay awake and out late, even in anticipation of some great music, but as soon as Kaylah started signing their first piece , Sly Stone's “If You Want Me To Stay,” her powerful voice locked me in. Kevin flowed and followed with a strong guitar solo, and I was totally hooked. The Salt People took my mind away; it was surreal. Kaylah’s voice and Kevin’s guitar molded into a kaleidoscope of unique sound. They each had their own energy and they managed to meet somewhere in the middle with the same vibe. There was no interruption, there was no distraction. Val began the second song “Higher and Higher” drumming almost like he himself (like limbo rythms) was singing a folk song. Kaylah didn’t miss a beat. The song grew and grew until Val ended with an explosion, a strong minute of rapid percussion. The smooth mixture of The Salt People’s talents make them sound right at home in the Bay Area. They write, arrange, and produce all their own music, as well as perform locally. While their roots stretch thousands of miles away, they made me feel present with energy of their music. And just as quickly as the show started, the show came to a communal end when Val invited the audience to sing along. It was an experience of unity - the artists and the audience became one. It was a truly magical experience, and I left the venue still feeling the power of their music in my body and my mind. The Salt People recently received the "Ambassador of Music" award from the 2018 Garifuna International Film Festival.